New Delhi: Government is likely to take a final decision on allowing foreign airlines to pick up stakes in Indian carriers in a “couple of weeks", with civil aviation ministry proposing a 24% cap as against 26% recommended by the industry ministry. Asked about the Department of Industrial Policy and Promotion (DIPP) proposing a 26% cap, they said, “Whatever decision the government takes, everyone will have to accept". Foreign Direct Investment (FDI) up to 49% is now allowed in domestic airlines, but the policy currently bars foreign airlines from investing in them primarily on security grounds. A 26% cap would allow a foreign investor to have voting rights in the board of an Indian carrier which is not allowed if the cap is 24%. While the DIPP feels that allowing foreign airlines to invest in domestic carriers would help them raise the much- needed equity, it does not find support among many Indian airlines which feel that fledgling carriers would be susceptible to hostile takeovers as they were passing through a difficult financial situation. 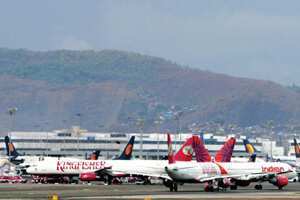 Besides Air India, domestic airlines like Kingfisher, Jet Airways and Spicejet have all reported losses due to high cost of operation and face severe liquidity crunch. Kingfisher Airlines is looking to raise working capital and wants the government to open up the domestic aviation sector for investment by foreign airlines, with its promoter Vijay Mallya saying only a foreign airline would be able to understand the problems of the sector. But the opponents feel that a foreign carrier, with deep pockets, could play havoc with the domestic market. They could also artificially lower the price of air travel to kill domestic competition. Even the Federation of Indian Airlines (FIA), which has Kingfisher as a major member, had opposed the proposal to allow foreign carriers to invest in domestic airlines. It had quoted instances of similar laws barring investment by foreign airlines prevailing in several countries, including the US and Canada. A few years ago, the US Congress and the Department of Transportation had thwarted attempts to allow foreign ownership of American airlines and did not allow British business magnate Richard Branson to launch a 100%- owned low-cost airline in the US. His company Virgin America is 75% owned by US-based Black Canyon Capital LLC. Indian aviation officials, requesting anonymity, said it was important that the government sought reciprocal opening of the airline industry in other countries before allowing open access of the Indian market to foreign carriers. “In an environment where restrictive foreign ownership in the airline industry is the norm, this prohibits foreign carriers from both targeting Indian carriers for acquisition and also using bilateral air service rights to their advantage," the officials said.